"Those who are born in affluence, those who are born in power, are opposing it," Union minister Ravi Shankar Prasad said. Priyanka Gandhi Vadra had taken on the BJP's chowkidar campaign yesterday. 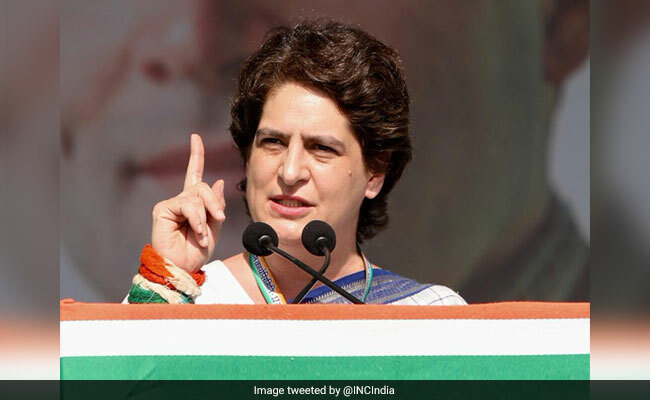 Priyanka Gandhi Vadra's pointed comment that only the rich can have chowkidars(watchman), not farmers, have drawn a sharp retort from the BJP, which is promoting the "Mein Bhi Chowkidar" campaign on the social media in a big way. Despite the opposition, the BJP campaign has gained huge traction, Union minister Ravi Shankar Prasad said, and then packed in a rejoinder. "Those who are born in affluence, those who are born in power, are opposing it," the minister said. "People on bail have problem with this campaign. People whose party, property, and family are on the line... those are opposing. Those who have a lot to hide are opposing it," he added, without naming anyone. The BJP has routinely attacked Rahul Gandhi on his family. Prime Minister Narendra Modi and other leaders of the BJP often mocked him as "Yuvraj (Prince)". Ahead of the 2014 national elections, the party had built a political narrative, contrasting what they called Mr Gandhi's privileged background and the humble origins of Narendra Modi, then an aspirant for the Prime Minister's post. The BJP has also routinely targeted the Congress over the corruption allegations against Robert Vadra - Priyanka Gandhi's husband and Rahul Gandhi's brother-in-law. Since her entry to active politics, Priyanka Gandhi has made it clear that she would take the allegations head on, making it a point to pick up or drop her husband off to the office of the Enforcement Directorate for his questioning sessions. Priyanka Gandhi Vadra had taken on the chowkidar campaign yesterday. "I met with a group of farmers... The potato farmers of western UP. One of the farmers told me, chowkidars are for the rich. We farmers are our own chowkidars," said Priyanka Gandhi, who is currently on a waterway campaign, sailing down the Ganga. The remark dovetailed with her party's allegation that PM Modi only helps rich industrialists, like Anil Ambani, Nirav Modi and Mehul Choksi. Rahul Gandhi, who is on bail in the case involving National Herald, has steadily targeted the "Mein Bhi Chowkidar" campaign, that started on Sunday after PM Modi added "Chowkidar" to his Twitter title. "You can keep trying Mr Modi, but the truth cannot be extinguished.Every Indian is saying it. #ChowkidarChorHai. P.S: Do force Sushma ji to add "Chowkidar" to her handle. It's looking very bad," he tweeted earlier. Today, at a rally, he said, "He (PM Modi) used to say I don't want to become PM.. want to be chowkidaar. Then he committed dangerous theft. Then he says 'sab chowkidaar'. You did it... Why are you making everyone chowkidar?"